Dhadak starring Jhanvi Kapoor and Ishaan Khatter is a remake of the Marathi blockbuster Sairat. But I will not be comparing the two movies for they have a distinct element to themselves and are different in their own skins. Dhadak is about how a girl from affluent family falls in love with a boy from poor background and of different caste. The story celebrates love and is somewhat of an honest depiction of the situation that still prevails in India. It correctly depicts how the caste is still an important factor when it comes to marriage. The actors do a decent job of giving justice to their characters. They make the scenes believable with a sort of simplicity and the dialogues are powerful. The script is intelligent and the dialogues delivered are a subtle reminder of the class difference between the two lead characters. Story: Parthavi and Madhukar fall in love but are held back by societal norms and caste restrictions and have to elope in order to be together. Review: With stunning locales ( courtesy the gorgeous Udaipur), soulful songs and expressive actors the first half of Dhadak paints a pretty picture. The experience of watching the film’s first half can be compared to eating a cake. When you take your first bite it is delicious but by the time you dig into it, you start feeling a bit full. Though vibrant and somewhat glamorous the first half of Dhadak lacks the charm that Director Shashank Khaitan’s previous films, Humpty Sharma Ki Dulhaia and Badrinath ki Dulhania had in abundance. Just before the interval there is a particularly thrilling scene that helps the film pick up its pace significantly. Post interval the setting of Dhadak drastically changes. We move from the cozy beds of royal looking palaces to unswept floors of humble dwellings. This is when the real emotions of the characters come out and the leads get to flex their acting chops. The second half is simple yet effective. As many people are claiming Dhadak is the sugar coated version of 2016’s Marathi blockbuster Sairat. It has a certain understated charm that shows the hardships of the characters without making us feel uncomfortable. Now talking about the climax scene of the film , it was not handled well. We knew something was going to happen but it took too long to materialise. had one of the best performances by newcomers in a long time. While Ishaan Khatter has done one film before this was Janhvi Kapoor’s first film. She is confident and appears to be super comfortable on camera. Ishaan Khatter is mature and a natural. The freshness that these two bring to screen is what makes dhadak so watchable. Do watch the film, it may make your heart skip a beat or or as Karan Johar puts it, a Dhadak! 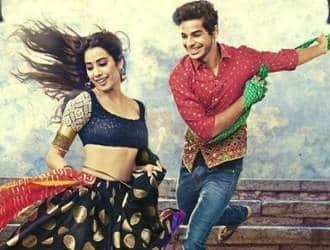 After the announcement of Dhadak, the entire Bollywood was buzzing with the news of the Sairat remake, which also marked the launch of two new celebrity kids, Janhavi Kapoor (Late actress Sridevi's daughter) and Ishaan Khattar (Shahid Kapoor's brother). Being the remake of a superhit Marathi film, Dharma production had big shoes to fill, which they unfortunately (and as expected) failed to do so. Talking about the basic plot, the storlyine of the movie remains the same as Sairat; a boy from a lower caste family falls in love with a girl from an affluential upper caste family and ends up eloping with her. The only difference in the two movies is probably the ending, the set up (Sairat being set up in Maharasthra and Dhadak in Rajasthan) and of course, the movies overall. While Sairat was known for its rawness and perfect depiction of a love story depicted in a small village, Dhadak failed to understand the nuances of the Marathi hit film and ended up adding too much masala to the simplistic movie. Another striking difference between the two movies was that Dhadak failed to understand the difference between class and caste, which changes the dynamics of the movie to a major extent. While the songs of Sairat were a super hit, the tgracksin Dhadak failed to connect with the audience. And let's not even talk about the acting. While Ishaan Khattar did a failry good job as Madhukar, Janhavi Kapoor failed to deliver with her portrayal of the independent girl Parthavi. To talk about Dhadak and not compare it to Sairat would be absolutely senseless. Dhadak might claim that it’s not a remake of Sairat but the truth is that some scenes have been completely copied. Dhadak adds the Bollywood masala to Sairat and that’s where it loses it’s charm. What’s captivating about Sairat is the sheer brilliance of direction without altering the lifestyle of people in villages. However, Dhadak paints an absolutely upgraded picture with a picture perfect heroine and sets that seem nowhere close to real life. However, as the movie progresses, the second half of the movie becomes bearable. The second half of the movie highlights the brilliance of the actors. Both the actors have performed really well in the movie. Janhvi Kapoor seems like an eye candy in the first half and a slightly more relatable person in the second.